We see our skin as an important part of how we present ourselves to the world and people around us. Whether consciously or not, we often associate the age and attractiveness of other people with the appearance of their skin. In addition to defining our appearance and wellbeing, healthy skin is essential in protecting us against infections, sunlight and pollution. As we age, the structure and functionality of our skin decline. Additionally, our skin structure and functionality are also greatly affected by external stress factors, such as UV radiation, climate, pollution and an imbalanced diet. 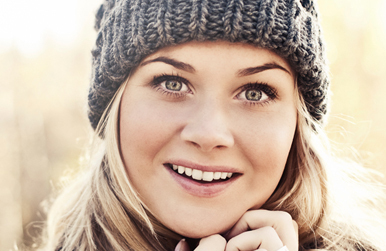 The understanding of how we best look after our skin is constantly expanding. Scientific documentation from recent clinical studies has greatly elevated our knowledge of how we can most effectively protect the appearance of our skin by adopting a sensible diet and nutrition. Our skin consists of three layers; 1) the epidermis, 2) the dermis, and 3) the subcutis (the hypodermis). 1. The epidermis consists of a thin layer of skin cells and is the skin’s outermost defence. As part of the continuous cell rejuvenation process dead skin cells in the epidermis are on average replaced by new cells every 4 weeks. 2. The dermis is a much thicker layer than the epidermis, providing structure, elasticity, strength and moisture balance to the skin. In young skin, 80% of the dermis consists of collagen. Collagen fibres form a solid framework that, among other functions, supports the skin’s surface and keeps it smooth and supple. 3. The subcutis is the skin’s base layer, consisting primarily of insulating fat tissue. Reduced collagen content may cause the fat tissue in the subcutis to become visible on the skin’s surface, appearing as cellulite. The elasticity of the skin is vital because its flexibility enables the skin to resist physical tension, thus protecting the body from injury and trauma as well as maintaining a smooth and firm skin appearance. The skin’s elasticity is dependent on collagen fibre levels in the dermis. Consequently, a breakdown of collagen fibres leads to a decrease in skin elasticity. There are many reasons why skin elasticity is so important, including fighting the prominence of wrinkles, stretch marks and cellulite as well as supporting normal wound healing and reducing scarring. Although external stress factors, such as UV radiation from sun exposure and dietary imbalances cause the skin’s elasticity to decrease, it is also affected by internal factors that are part of the natural ageing process, particularly in post-menopausal women. 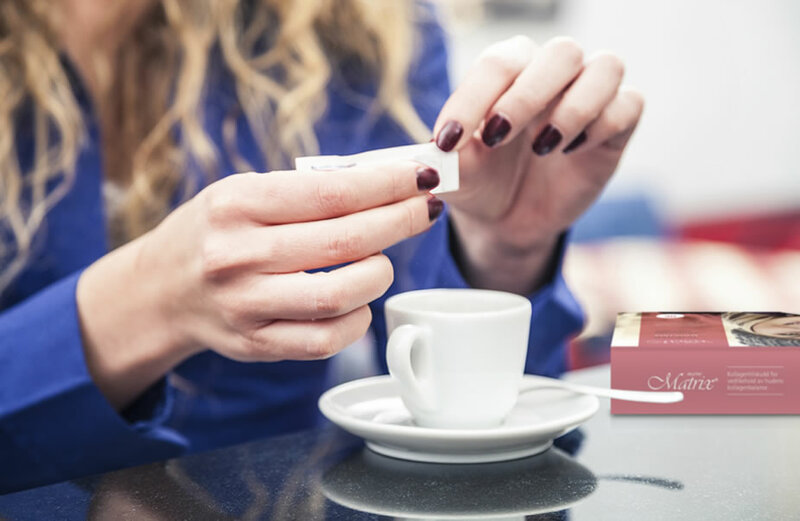 Recent clinical studies have shown that the intake of specific collagen peptides may improve skin elasticity by up to 30% after just 4 weeks*. Wrinkles form when the structure of dermal collagen breaks down and it is no longer able to support the skin’s surface as it does in young, elastic skin. Despite being part of the biological ageing process, wrinkling is in large part caused by external stress factors, such as UV radiation from sun exposure, pollution, cigarette smoke and dietary imbalances, all of which can have adverse effects on the skin’s collagen balance and elasticity. The formation of wrinkles in facial skin is usually the principal sign of ageing, although loose skin on the neck, chest and on the back of our hands is a result of decreasing skin elasticity. Recent clinical studies have shown that the intake of specific collagen peptides reduce wrinkle volume by up to 50% after just 8 weeks**. Stretch marks are caused when the dermal collagen structure is torn as a result of the skin not being elastic enough to resist the physical stresses caused during pregnancy or as a result of rapid growth or weight gain. Even after the stretch marks have developed, their appearance is affected by the skin’s collagen balance and elasticity. Therefore, maintaining the skin as firm and elastic as possible may reduce the prominence and visual appearance of stretch marks. Cellulite forms when elasticity and dermal collagen content decrease at the same time as the fat tissue in the subcutis increases and hardens. As a result the fat tissue becomes ‘visible’ just beneath the surface of the skin and appears as what is commonly called ‘orange peel skin’. Maintaining an optimal collagen balance to secure a firm and elastic skin can therefore help to reduce the prominence of cellulite. Normal skin pigmentation helps to protect the skin’s collagen structure against UV damage. 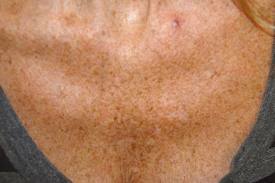 The skin’s protective pigment, melanin, is produced by special skin cells called melanocytes. Although pigmentation spots may appear after excessive exposure to the sun, they also appear as part of the normal ageing process. These factors may cause melanocytes to increase in size and aggregate to form clusters. Copper is an essential trace element that contributes to normal skin pigmentation but it is not naturally produced in the body and therefore needs to be supplied through diet. Hair and nails are appendices of the body’s skin system (integumentary system), and are considered to be part of the skin. So healthy and vibrant skin is also important for the appearance, normal growth and functionality of hair and nails. Just like the skin itself, hair and nails require essential nutrients to be supplied from within the body. Hair grows an average of 1-1.5 cm a month. 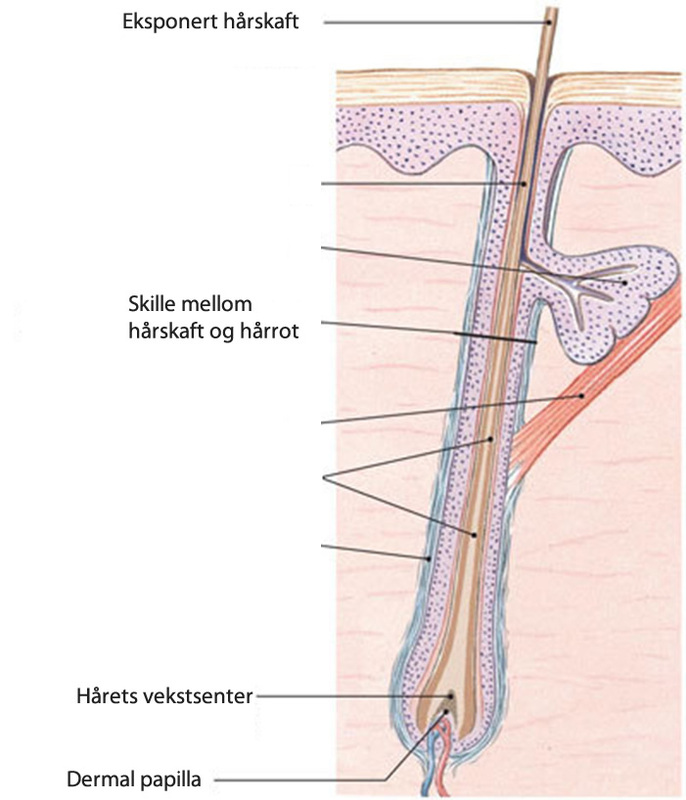 Hair growth begins in the dermal papillae, tiny bulbs at the base of hair follicles, located in the dermis. The fibroblasts of the dermal papillae send signals causing the upper cell layers of the hair root to grow, pushing the hair shaft upwards. Nails grow an average of 3 mm a month. 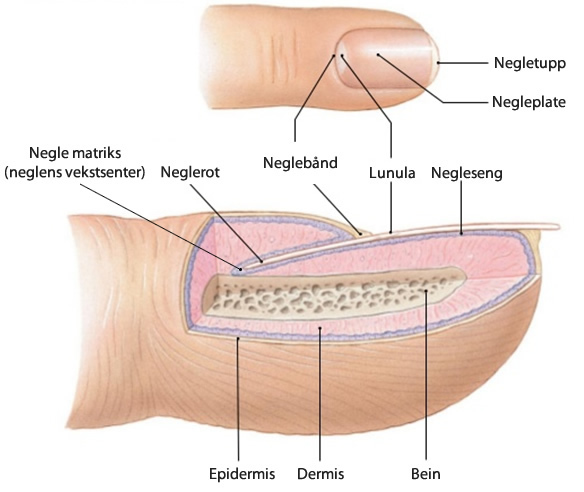 Nail growth begins in the nail matrix, at the base of the nail root. The fibroblasts of the nail matrix send signals causing the upper cell layers to grow, pushing the nail plate outwards. Among other constituents, Marine Matrix® contains essential minerals, including zinc and selenium that contribute to maintenance of normal hair and nail growth. In addition, Marine Matrix® contains copper, that contributes to normal hair pigmentation. As with other aspects of our general health and wellbeing, the health of our skin is relying on supply of essential and vital nutrients from a sensible, healthy and balanced diet. Fresh vegetables, fruit and cereals provide vitamins, minerals and antioxidants, which all are important nutrients in protecting and maintaining a healthy skin. It is important that your daily fluid intake is adequate in order to keep your body hydrated. Fresh water works best also for the skin. Marine Matrix® contains specially formulated and documented collagen peptides which nourish the deeper layers of the skin from within. These specific collagen peptides are absorbed rapidly into the bloodstream to reach the cells in the deeper layers of the skin, where they have been shown to improve skin elasticity*, which firms up the skin, and to reduce wrinkles**. In addition, Marine Matrix® also contains essentials vitamins and minerals, including vitamin C, copper and zinc, which all have proven effects on maintaining a healthy and vibrant skin.